This is longer than the usual #discuss post, but I'd love to hear about how dev.to takes their notes. What systems do you all use? Who does it all with a computer, and how do they handle meeting notes? Who has some paper-based system I've never heard of? I'm pretty curious what y'all up to. I've tried a lot of systems. I've tried Evernote. I've tried a wiki (several wikis, really). I've tried text files on the filesystem. I've tried Google Drive. None of these systems worked for me. Their organizational schemes, and the fact that I need a working computer to use them puts too many barriers between me, and the notes I want to write. The note taking system that works best of me is Bullet Journaling, which is a structured way of categorizing and organizing notes. 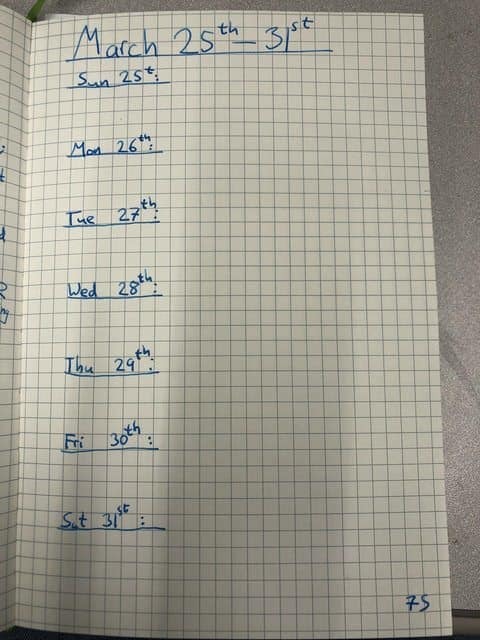 The practices that I find most useful are adopting a set of shorthand symbols for each note, keeping a weekly log, keeping a monthly calendar and keeping an index of my notes. I take notes at all the meetings and trainings I attend. Sometimes my notes are just "I attended this meeting". Other times, I come out with a list of todos, and still other times I just come out with a bunch of things I want to remember. 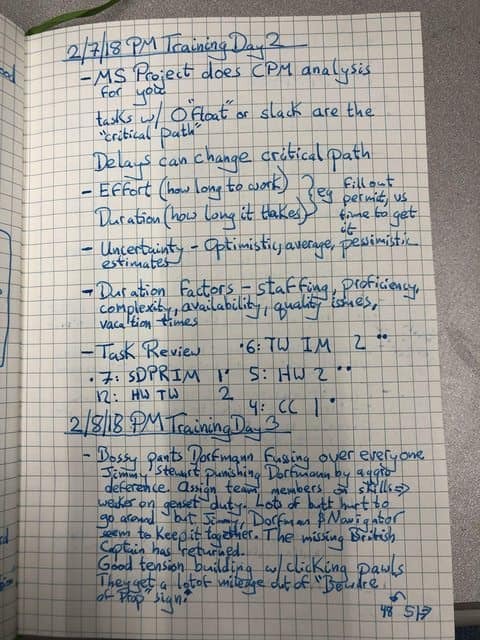 I kept track of what the training was about and observations on The Flight of the Phoenix, a training aid our instructor chose. I didn't have any todos or other particularly notable notes on this page, but it gives a flavor of how I use bullet journaling in the day to day. 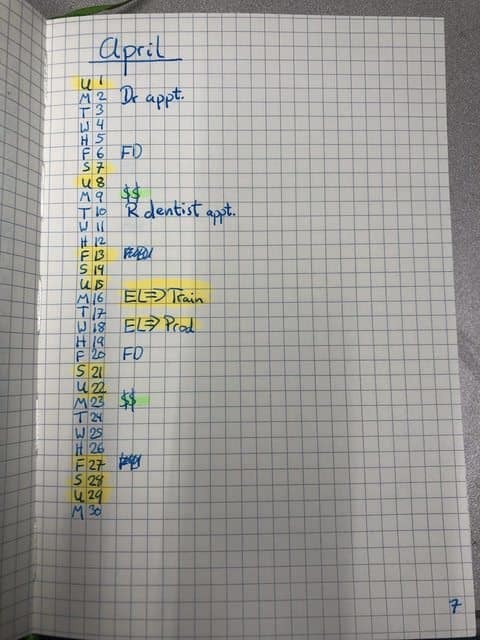 I adopted a set of symbols based on the bullet journal suggestions to indicate different types of notes. I went with a subset of the bullet journal symbols, because I found my todos are generally not very complicated. They either need to happen, happened or aren't going to happen. I didn't find moving them around from day to day very useful. I use an open circle to indicate a todo. I put an "X" through the circle when it's done or cross it out when it becomes irrelevant. I write out the log at the start of the week, then as I do things, I put a short note in on each day. "Attended stakeholder meeting," "Wrote workflow container," "Created permit entry UI," "Mentored junior developer," etc. The weekly logs are great for looking back, but sometimes I want to look forward. I keep a couple months calendar in my journal to help plan when my busy periods are likely to be. As I learn new things, I put important events in my calendar, whether they are target release dates, testing cycles or demos. I also use these calendars to plan around personal events, like vacations or doctor appointments. 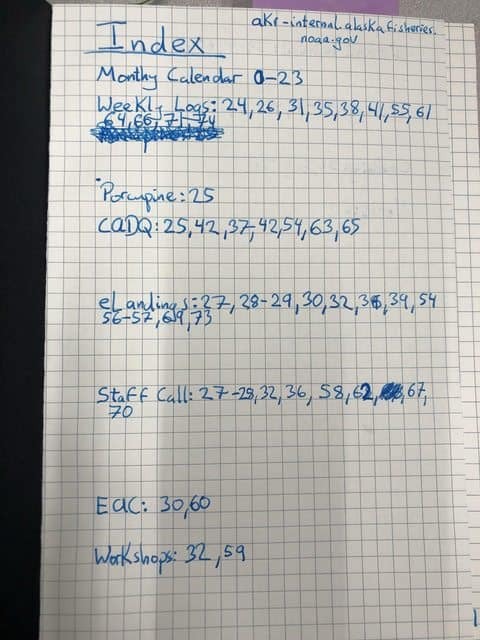 Keeping an index sounds boring and difficult, but I find that if I'm diligent, it's not particularly difficult, and it turns out to be one of the most useful parts of my journal. The payoff is six months after you've written a bunch and can't quite remember where that important technical decision originates from. Just look at the project meetings, or other promising entries and cut your search time down! Whatever method you choose to take notes in, having a system makes it easier to use the notes after writing them. I find the Bullet Journal technique very useful, but it took me a couple tries to settle in on how I wanted to record information. I'm still learning and changing how I take notes - never hurts to change! If you like what you read here, consider visiting my blog for more! 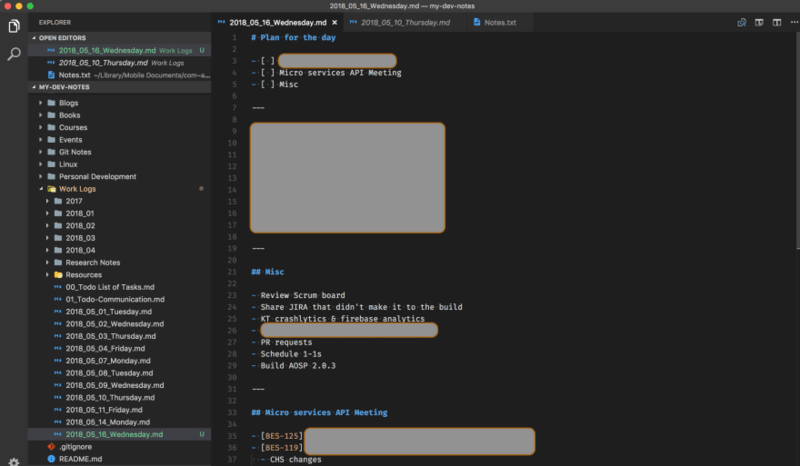 I use visual studio code as my editor and I make notes using markdown. Initially it was a bit difficult, but I got used to it now. 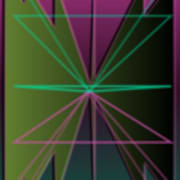 [ ] for todo item and after completing I make it as [x]. For important items, I make it bold using **. I commit the notes to my private bitbucket repo, and as it's markdown I get pretty clean UI when I refer my notes later. 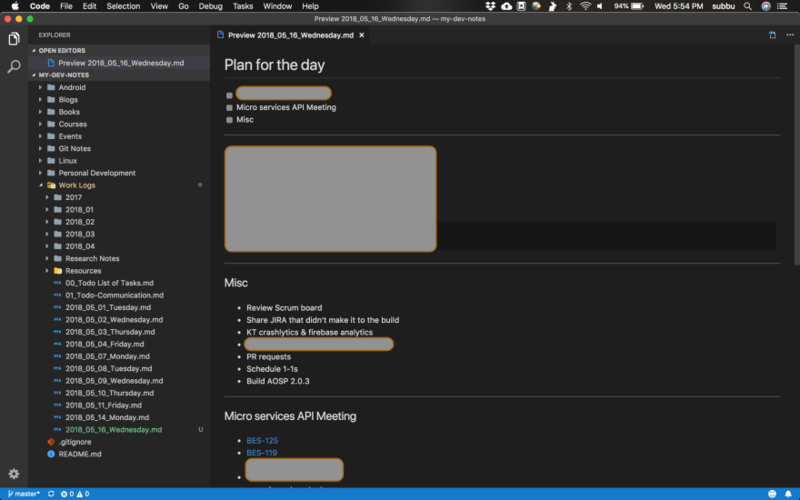 very creative way, at the same time, if you are working at the same IDE it would be very easy to just jump to next file and update your notes, I like it. Do you have this in a synced folder so you can take notes across machines? I sync the notes using 'git' on my private bitbucket repos. Hey that might be the tool I need. Thanks for sharing. I'd been looking for a software tool for this for about 7-8 years - went through ConnectedText/OneNote/Evernote until I found out InfoQube two and a half years ago. It is the closest thing to the holy grail in terms of note taking, and personal information management for me. Because the software gives you so much flexibility it can be rather confusing at the beginning, but you will appreciate the freedom later on. It has Evernote import too. Great article, thank you! I do basically the same thing but use Joplin, an open source alternative to Evernote. Joplin syncs across devices and they have a mobile app. It has more features than the free version of Evernote and this project is constantly improving. I have all my notes at my fingertips on any device no matter where I am. Might be worth a look to you and others. Bullet Journaling has been the most natural and easiest way for me to keep notes as well. My system is setup a lot like yours, but I keep two notebooks. My main notebook is set up as simply as possible (I do add some color to the monthly log but that's it) and the second notebook is for uniquely work related things (meeting notes, project design, brainstorming, etc). I'm going to adopt your eyeball icon. Thanks for sharing! I didn't invent the eyeball icon, but I love it all the same - hope it's useful!